Meaning of name: Gaelic for 'Columba's island'. Iona is a small island located in the north-west region of Scotland that forms part of the Inner Hebrides. Though small in size, this island has played a very large role in the history of Scottish and Celtic Christianity. It is renowned as the place where Saint Columba founded a monastery after being exiled from Ireland, which grew into a vibrant center of Celtic Christianity in the British Isles. From Iona, missionary monks traveled to other parts of Scotland, Britain, and Europe, spreading Christian teachings. It is conjectured that Iona may also have been the original location for the writing of the Book of Kells before it was moved to Ireland following Viking raids. The reputation of the island as a center of learning and sanctity was so great that it was (and is) known as "Holy Island" and many Scottish kings are buried there. Iona's fame as a place of learning and Christian mission spread throughout Europe and it became a major site of pilgrimage. In Gaelic, the island is called Ì Chaluim Cille (Saint Columba's Island), or sometimes just Ì or Idhe. Known for its tranquility and natural beauty, Iona is a popular Scottish tourist attraction today renowned for its ancient connection to Celtic Christianity. 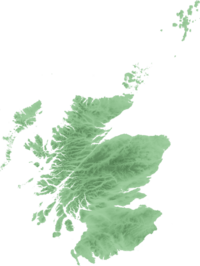 The island of Iona lies approximately one mile (1.6 km) from the coast of Isle of Mull. The island is 1 mile wide (1.6 km) and 3.5 miles (5.6 km) long with a resident population of 125. Iona's highest point is Dùn Ì (101 m, 331 ft), an Iron Age hill fort, dating from 100B.C.E.-200C.E. Its geographical features include the Bay at the Back of the Ocean and Càrn Cùl ri Éirinn (The Hill with His Back to Ireland), said to be adjacent to the beach where St. Columba first landed. Away from the historic buildings, Iona offers enjoyable walks to the north of the island, with pristine white sand beaches, and south and west to the Bay at the Back of the Atlantic. Pebbles of the famous green Iona marble, commercially mined in the nineteenth century (the quarry and original machinery survive) can be found on the island's beaches. This page (folio 292r) contains the lavishly decorated text that opens the Gospel of John. In 563 C.E., Saint Columba, also known as Colm Cille, left his native Ireland and founded a monastery at Iona with 12 companions. The Catholic Encyclopedia reports, "The motives for this migration have been frequently discussed…[including the theory] that his departure was due to the fact that he had induced the clan Neill to rise and engage in battle against King Diarmait at Cooldrevny in 561… [However,] Cardinal Moran accepts no other motive than that assigned by Adamnan, 'a desire to carry the Gospel to a pagan nation and to win souls to God'" (Lives ot Irish Saints in Great Britain, 67). The consensus is that Saint Columba was exiled from Ireland as a result of his involvement in the Battle of Cul Dreimhne, never to look back at his native land. From Iona, Columba and his 12 companions set about the conversion of pagan Scotland and much of northern England to Christianity. Iona's fame as a place of learning and Christian mission spread throughout Europe and it became a major site of pilgrimage. Iona became a holy island where several kings of Scotland, Ireland, and Norway came to be buried. 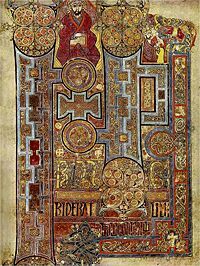 Many believe that the Book of Kells was produced, in whole or in part, on Iona towards the end of the eighth century before they moved back to Ireland. A series of Viking raids on the monastery on Iona began in 794, and after its treasures had been plundered many times, Columba’s relics were removed and divided two ways between Scotland and Ireland in 849 C.E. and the monastery was abandoned. A convent for the Order of Benedictine Nuns was established in 1203, with Beathag, daughter of Somerled, as first prioress. The present Benedictine abbey was built in the same period. The monastery itself flourished until the Reformation when buildings were demolished and all but three of the 360 carved crosses destroyed. The cloisters of Iona Abbey. One of the oldest and most important Christian centers in Western Europe, Iona Abbey is considered the point of origin for the spread of Christianity throughout Scotland. Iona Abbey is located on the Isle of Iona, just off the Isle of Mull on the West Coast of Scotland. The abbey was founded by St. Columba after he had been linked to founding Oronsay Priory. In 563 C.E., Saint Columba arrived in Iona from Ireland. He founded a monastery on this site. The abbey grew quickly and soon became one of the largest religious centers in western Europe. Monks from Iona set up religious centers as far away as Switzerland. The Chronicle of Ireland was also produced at Iona, until about 740 C.E. In 806 C.E., everyone at the abbey was found dead. This has been attributed to a Viking massacre. Three other Viking attacks are recorded within eleven years of this date. The Celtic Church remained separate from the Roman Catholic Church for many centuries. However, by the thirteenth century, Iona had been absorbed into the Roman Church. It became part of the Benedictine order. Another Benedictine foundation, the Iona Nunnery, was established nearby in 1203. With the advent of the Protestant Reformation in Scotland, Iona, along with numerous other abbeys throughout Scotland, England, Wales, and Ireland, were closed or destroyed. Many of Iona's buildings were demolished. In the nineteenth century, Iona was granted to the Church of Scotland, which undertook extensive restoration of the site. In 1938, the Reverend George MacLeod led a group that rebuilt the abbey, and founded the Iona Community. This ecumenical Christian community continues to use the site to this day. Many early Scottish kings and chiefs, as well as kings from Ireland, Norway, and France are buried in the Abbey graveyard. (There are thought to be 48 kings there.) These include Duncan—the victim of Macbeth. Several Celtic Crosses are to be found on the Isle of Iona. St Martin's Cross (dated to the eighth century) still stands by the road side. A replica of St John's Cross is found by the doorway of the Abbey. The restored original is located in the Infirmary Museum at the rear of the abbey. 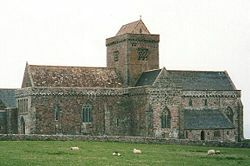 Iona Abbey, now an ecumenical church, is of particular historical and religious interest to pilgrims and visitors alike. It is the most elaborate and best-preserved ecclesiastical building surviving from the Middle Ages in the Western Isles of Scotland. In front of the Abbey stands the ninth century St Martin's Cross, one of the best-preserved Celtic crosses in the British Isles, and a replica of the eighth century St John's Cross (original fragments in the Abbey museum). In 1549 C.E., an inventory of 48 Scottish, eight Norwegian, and four Irish kings was recorded. None of these graves are now identifiable (their inscriptions were reported to have worn away at the end of the seventeenth century). 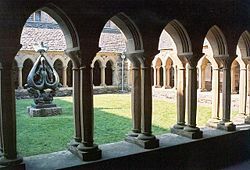 Other early Christian and medieval monuments have been removed for preservation to the cloister arcade of the Abbey, and the Abbey museum (in the medieval infirmary). The ancient buildings of Iona Abbey are now cared for by Historic Scotland. Iona Nunnery survives as a series of exquisitely beautiful twelfth-thirteenth century ruins of the church and cloister, and a colorful and peaceful garden. Unlike the rest of the medieval religious buildings, the nunnery was too fragmentary to restore, though its remains are nevertheless the most complete survival of a medieval nunnery in Scotland. In 1938, George MacLeod founded the Iona Community, an ecumenical Christian community of men and women from different walks of life and different traditions in the Christian church, committed to seeking new ways of living the gospel of Jesus in today's world. This community is a leading force in the present Celtic Christianity revival. The Iona Community runs three residential centers on the Isle of Iona and on Isle of Mull. These are places of welcome and engagement giving a unique opportunity to live together in community with people of every background from all over the world. Weeks at the centers often follow a program related to the concerns of the Iona Community. ↑ Hamish Haswell-Smith, The Scottish Islands (Edinburgh: Canongate). ↑ Ordnance Survey, Homepage. Retrieved December 27, 2007. ↑ Census 2001, Scotland Census. Retrieved December 27, 2007. ↑ New Advent Catholic Encyclopedia, St. Columba. Retrieved December 27, 2007. ↑ BBC, Iona—A Beacon of Light Through the Dark Ages. Retrieved December 27, 2007. ↑ Travel Scottland, Isle of Iona. Retrieved December 27, 2007. ↑ The Iona Community, Homepage. Retrieved December 27, 2007. School of Iona Catholic Encyclopedia article. This page was last modified on 5 March 2018, at 23:15.